We carry a full line of laptops by Intel, Asus, and Lenovo as well as custom built laptops. With a selection of processors including the Dual Core, Core i3, Core i5 or Core i7, we have the processing power you need for any variety of tasks. Our laptops come standard with DVD RW +/-, digital card readers, your choice of operating systems and much more. 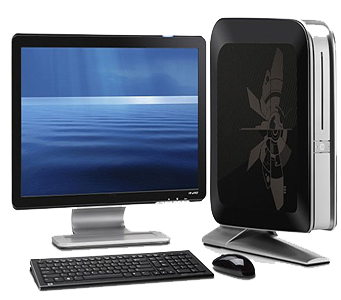 As an authorized Microsoft Distributors, we offer Microsoft Products such as Windows 7 Home, Premium, or Professional. We custom build home PCs, Business Workstations, and Servers to our customers' needs. Our devices can be customized for blazing fast gaming, professional productivity, or as a simple PC for homework and internet browsing. As an Intel Gold Provider we are able to offer a 3 year Manufacturer warranty from Intel at no additional charge!